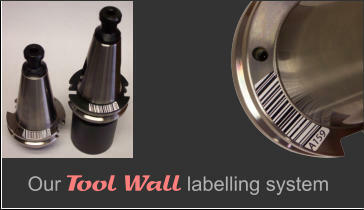 A labelling system not only for Tool Wall but suitable for all users. 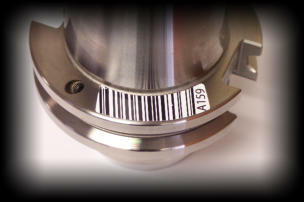 Label location hidden in grove, away from chip impact and below tool changer gripper contact. 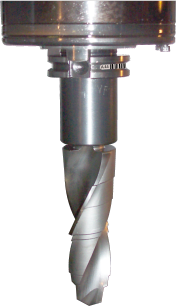 Our Tool Labels are cut from a material that is very durable for this environment with a special adhesive and specially coated after printing. 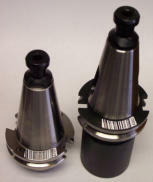 Label location is facing away from chip impact area. Tool Labels are a simple solution. Our Tool Labels are cut from a material that is very durable for this environment with a special adhesive and specially coated after printing. The bar code matches the database in the Tool Wall software. 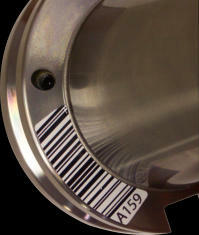 Adding a bar code scanner to our Tool Wall system automates many functions even further. Note: Decals have different sizes. Please indicate holder type when ordering. Note: This label type is larger and is designed to work with the Tool Wall system which never stores or carries a tool holder on the Tool Holder Flange. Do not use this labels type if your system impacts this area! It will damage the label. CNC Tool Storage and CNC Tool Management combined in one system. Check your holder as some are narrower. Wider is ok.
A Mini RFID option for tool number and offset recording is in the making, but not yet sold.